I have made more tag blankies than anything else. They don't use much fabric or take much time. My son used to love them as a baby and I've probably made him 6-8 different ones over the years as his likes changed. My daughter has 3 of her own now. 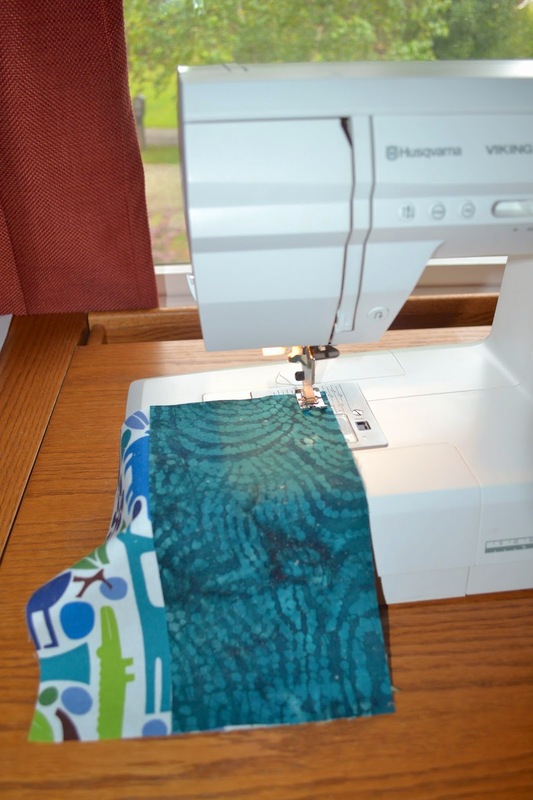 You'll need a total of 1/4 yr cotton quilting fabric for the front, 1/4 yard minky, fleece, or fuzzy fabric for the back, 1/4 yard fusible fleece, and assorted ribbon (in addition to a sewing machine, pins, scissors, etc). 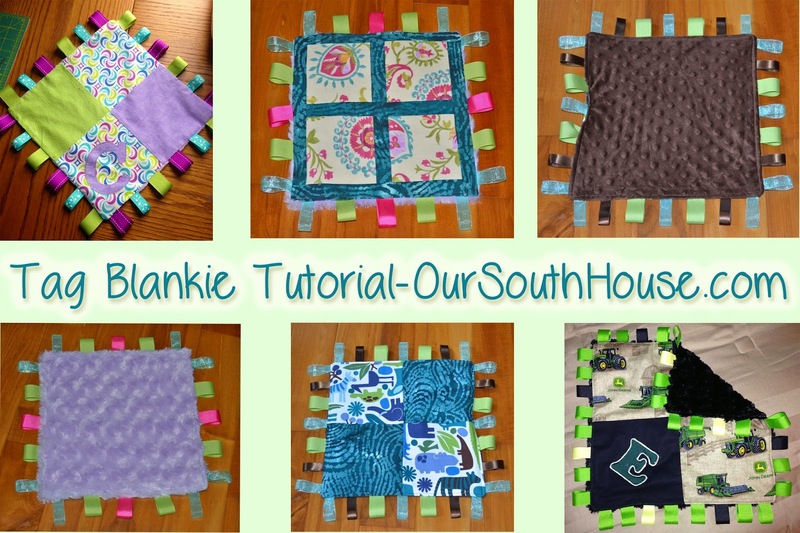 You will have enough to make 2-3 blankies with that much fabric but if it is cut any narrower, it won't work. First, you need to decide what you want it to look like. You can just cut a single square from your quilting fabric or you can do 4 squares- my favorite. Overall you want the front piece to be 12"-14" finished size. I cut my 4 squares to 6 1/8" square. This number isn't as important as just making the squares even. Feel free to make them bigger or smaller as you see fit. Then begin sewing. Sew 2 squares together, then the other 2. I use 1/4" seams. 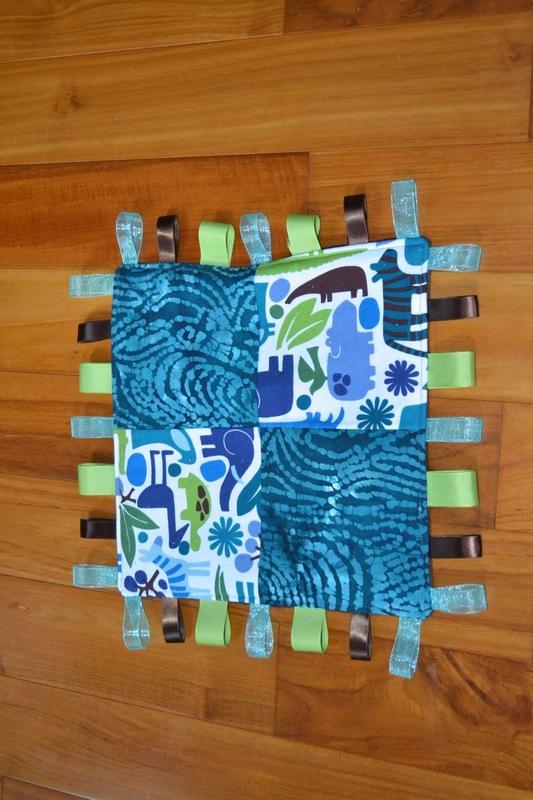 Once you have 2 rectangles, press and sew those together. Press the front and check placement. At this point if something is off you can befriend a seam ripper and begin again. Here is what the back of mine looks like. I cut my fusible fleece to be slightly smaller than my front piece. This keeps it from adhering to my pressing cloth or ironing board. Follow the instructions that come with your fleece and iron it to the wrong side of the fabric. This step gives a bit more cushion and helps to the keep the raw edges from unraveling over time. Now it's time to place your ribbon. I cut my pieces to 4.5" lengths and lay them out in a pattern. When it's time to pin, I like my ribbon pieces to be evenly spaced. I begin with the centers of each side. I fold a piece of ribbon in half and pin it centered on the seam, raw edges lined up. Notice that my pin is roughly 1" from the edge of the fabric so that I won't have to remove the pins as I sew risking shifting. The way my side ended up I spaced my ribbons 7/8" apart. It's slightly different for each blankie. Play around until you find something appealing or just make them completely random. REMEMBER! Leave 3/4" from each corner bare- no ribbon in this space. We will be using 1/2" seams when we sew the edge and we don't want to catch our ribbons in that. Here is mine all pinned. Stitch around the blankie close to the edge just to tack the ribbons in place. In each corner, pin the 2 ribbons as shown. This helps to ensure that neither will move and get caught in our edge seam. Now measure your finished front piece and cut the backing (minky, fleece, etc) to fit that size. Lay the minky right side down ON TOP of the ribbons. Using a 1/2" seam, stitch around the edge of the blankie leaving a 3" hole in one side. Turn your blankie right side out through this hole. 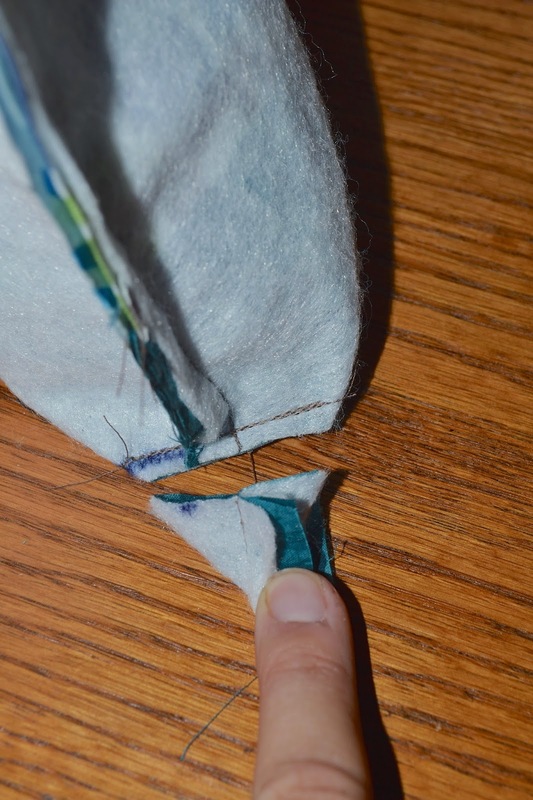 Top stitch around the entire blankie using a scant 1/4" seam- this will close your hole. This morning on my way back to PA I stopped at my favorite home furnishing store- Ikea. If there isn't an Ikea rehab facility, there probably needs to be. That place is an addiction. The prices are cheap, the products are gorgeous. I'm not sure I have ever left there empty-handed. When I first started toying around with replacing the kitchen I sat down with a kitchen planner program I found online and played with layouts. I wanted more counter space, a breakfast bar, and a peninsula in place of the island. There is very little wall space in our house. We have huge windows everywhere. It's amazing for letting light in but leaves layout and design options very limited. There was really only 1 layout that would work for me. I took my plans to 2 different big box retailers and had them price out a kitchen for me. I was over $20,000 at both places. Now I am not trying to give my husband a heart attack at such a young age so I had to come up with a different plan. Then it hit me- Ikea! 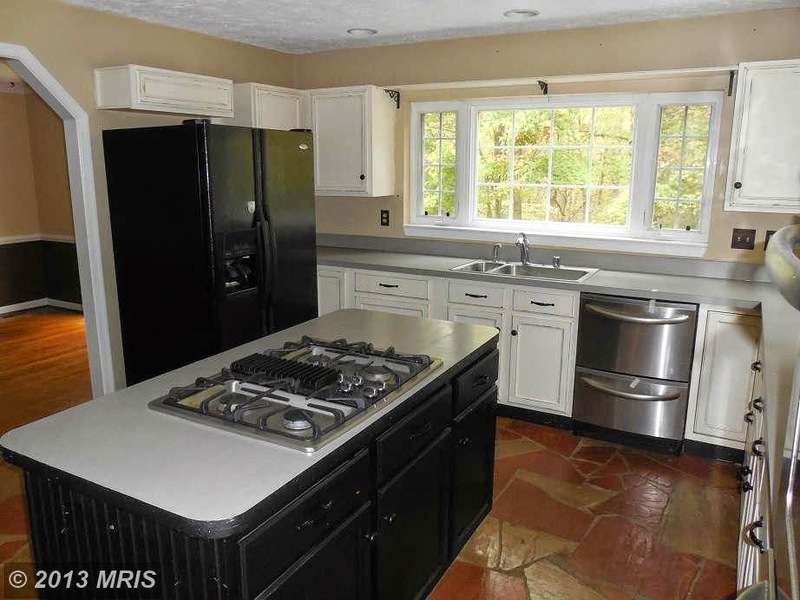 Our PA house has a kitchen island from there. Three years in and it's as solid as the day we built it. So I hopped on their website and you can use your own kitchen measurements with their products and design a kitchen- it's fabulous!!! Today was the day. I went into the store, ordered my kitchen and Ceasarstone quartz counters and I came in UNDER $8000!!! Sure, I have to build the cabinets with an Allen wrench but hey, for a $12,000 savings I'd build them with toothpicks! 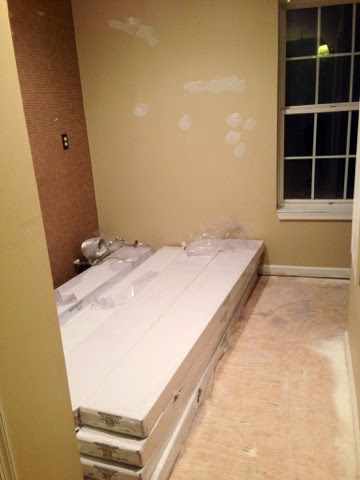 The cabinets will be delivered in flat boxes and I can put them together as time allows. Once we have them all installed, the countertop people will come out, do an exact measurement, cut our counters, and install those for us. And now here is the new layout. 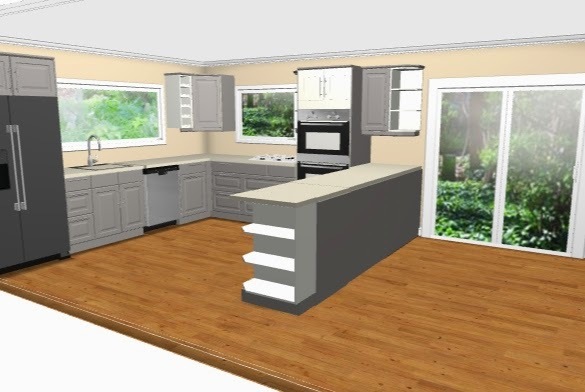 These images are screenshots of the Ikea kitchen design program I used. 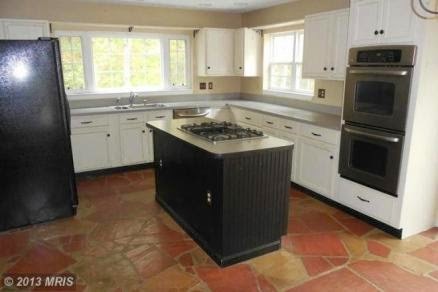 Keep in mind, the double oven cabinet will also be gray but it didn't give me that option on the computer. The wine rack next to the sink will also have a gray panel on the end to match the rest of the kitchen. The peninsula counters will overhang 12" on the back to give me my breakfast bar. I accidentally bumped the sliding glass door in the program and just noticed- it won't be that close to the peninsula in real life. The price on the cabinet just lets you compare the prices of different styles using a basic kitchen model. That wasn't my cabinet total, sadly. 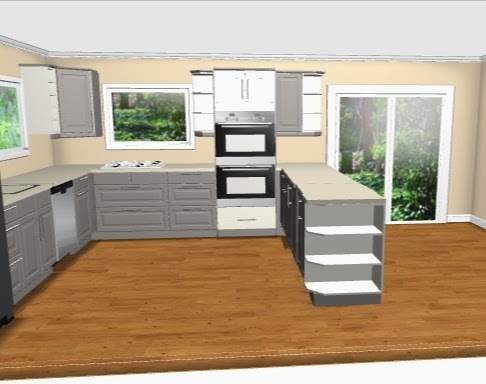 But all the cabinet style doors and counter options are laid out for you to move around and try out. It really lets you get a feel for what you're buying. If you can't tell, I am EXTREMELY excited about my new kitchen. Hopefully it lives up to my expectations. After a much anticipated delivery, which was delayed several times, our hardwood arrived! 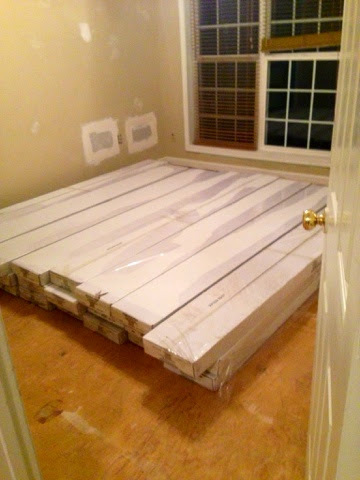 We ordered our flooring from BuildDirect.com. 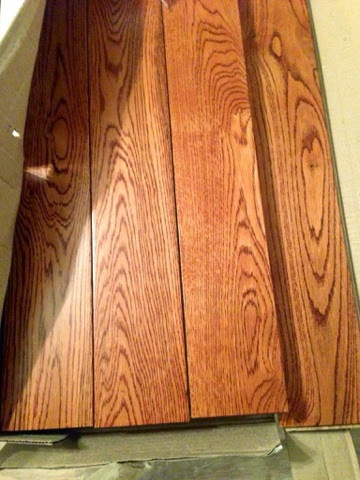 For what we wanted (upper-level, solid oak in 3ish inch planks) they were by far the cheapest. We didn't want open knots. Closed knots (ones you can't feel when you run your hand over the plank) were fine as long as there were only a few. We wanted longer average board lengths, and somewhat consistent color. Build Direct offers a level above what we ordered that includes even longer board lengths, no knots whatsoever, and a very consistent color. We wanted our floors to have a bit of character while still maintaining their class. The standard level worked perfectly for us. Due to some unforeseen shipping issues, our order was delayed from late Thursday/ early Friday until Monday. An on-time delivery gave Husband and Brother-in-Law 7 days to let the flooring acclimate to its new surroundings (absolutely necessary) and then install the whole upstairs and living room. It would have been tight but doable. When the order was delayed that threw a massive wrench in the plans! The movers would be here to unload all of our furniture and put it where- the front yard? Yikes! Thankfully Build Direct worked with me and agreed to split an additional fee to get the flooring here Saturday. They don't guarantee shipping dates. So if you order from them, know that the date they give you may be an estimate. A 20" semi trick and trailer made it down our windy, narrow private road and up to our house. The driver left me a very harried voicemail worried he wasn't going to make it- but like a pro, he did! He dropped off the trailer and left. Husband, BIL, and I had to unload 7,857 POUNDS/ 2816 square feet of hardwood flooring. That's 110 boxes of solid wood. It's hot in Virginia this time of year! Their hard work only cost me a case of beer, some awesome tacos, and a cast iron skillet apple crisp- it was worth every penny! 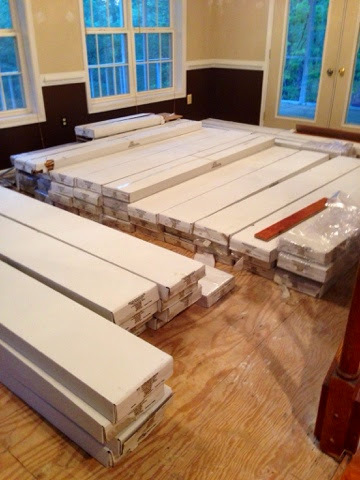 Want to see just how much flooring we ordered? That's the first floor load- about half. There used to be stained carpet in this room. We discovered that the slightly funky smell in this house left with the carpet. Yay! We were very lucky that the subfloor is in excellent condition. So far none has to be replaced but the kitchen floor hasn't been torn out yet. 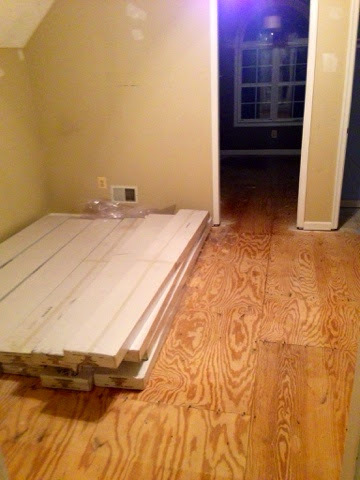 The flooring has been spread throughout the house. Ideally you'd lay each box side by side and open them- we don't have the space for that. We removed the plastic from the boxes and hope that's enough. It has to be enough. So starting on Monday or Tuesday, the flooring installation will begin. I'll make sure to post a tutorial once we get the hang of it. Would you like to see what's inside those beauuuuutiful boxes?! So since we had to wait around for the flooring to acclimate, we were able to patch all the holes in the drywall. If you remember, we had PB pipes throughout our house. We hired a plumber to replace them with PEX- an awesome product! We opted to do the drywall repair ourselves once the plumber was done. You'll notice some patches in the above pictures and a ton of filled nail holes. The previous owners were early American antique collectors- they had walls full of neat things. But with them moving out, there were hundreds upon hundreds of nail holes everywhere. Were. Past tense. Those are now gone and I can get to painting the walls once I finish with the movers at our PA house. Until the hardwood floors show up, there's not much to do at the new house. Husband is there for the next few days power washing, weed whacking, etc. I'm sure he's enjoying the quiet. The kids and I are still at our house in PA. The movers come in 6 days!! If you ever have to move, I highly recommend hiring movers. A team of big, burly guys show up, pack everything in your house in a day or 2, load it, and drop it off in the new house. It's wonderful!!! So today we have a bit of a change of pace from home renovation. As promised in my previous post, I am going to walk you through my absolute favorite gift to make for new moms (or dads!). 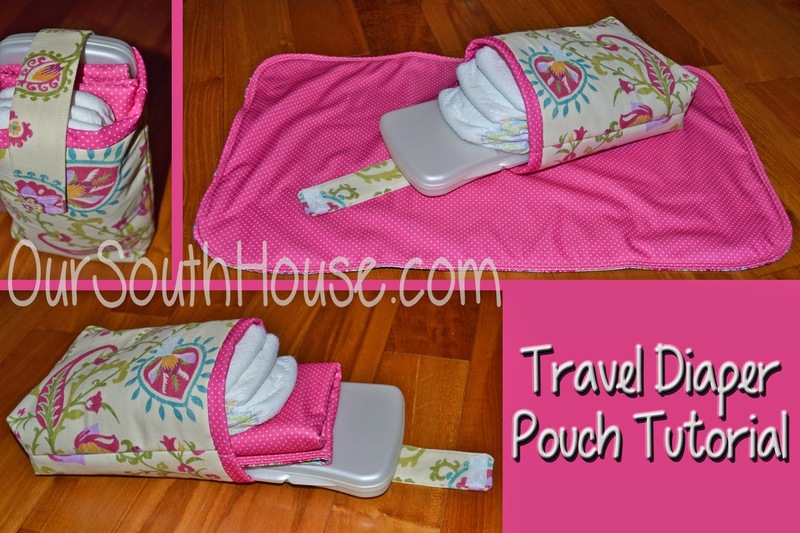 It's a travel diaper pouch. 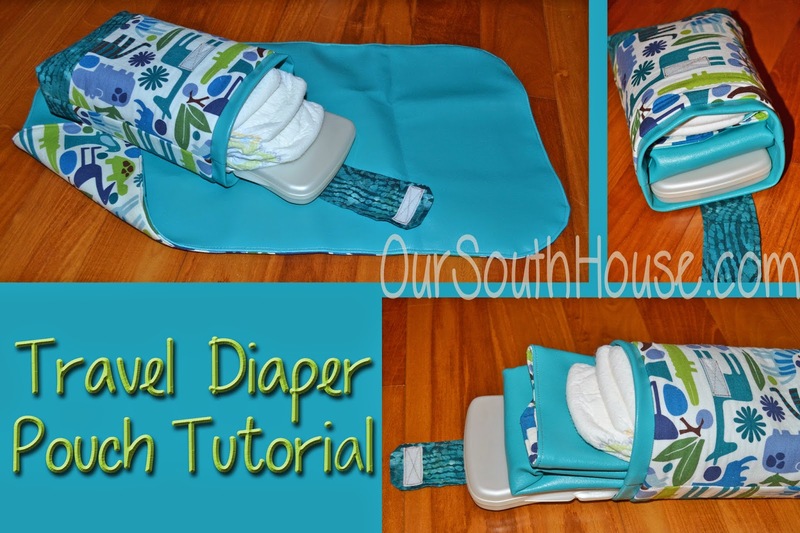 Once finished, you have an awesome little pack that holds a few diapers, a thin pack of wipes, and a changing pad! I have made myself 2 because I couldn't decide which fabric I liked better. When heading out to run errands, it's the only thing I always bring. When at someone's house, it's nice not to have to drag the whole diaper bag in. This thing is a bit bigger than a clutch and can be tossed into almost any purse or bag if you're not in the mood to cart the diaper bag. Husband hates having to take a diaper bag places but he has no problem grabbing this. I've even been able to stuff in a spare change of clothes, and a sippy cup. They're sturdy! It's a fast project so if you're feeling generous, maybe make one specifically for mom and one more for dad. It also packs up very small so it can easily be mailed. The blue one was made with an exterior of quilter's cotton and batik with an interior of this great marine vinyl I found on clearance. I couldn't imagine reupholstering a boat in this stuff but it's GREAT for this project! The pink is made with an exterior of a semi-heavy home decor fabric and an interior of PUL (polyurethane laminate). Both the vinyl and the PUL are waterproof and messes are easily wiped up or the whole thing can be tossed into the washer. You'll need just over 1 yard fabric total - I like to use scraps or things I find in the remnants bin at my local craft store. If you're buying off the bolt, get 3/4 yard of 2 different fabrics to be safe. I prefer one of the fabrics to be heavy. PUL is thin which is why I paired it with a home decor weight fabric. Vinyl is heavy which is why it was paired with quilter's cotton and quilter's batik. 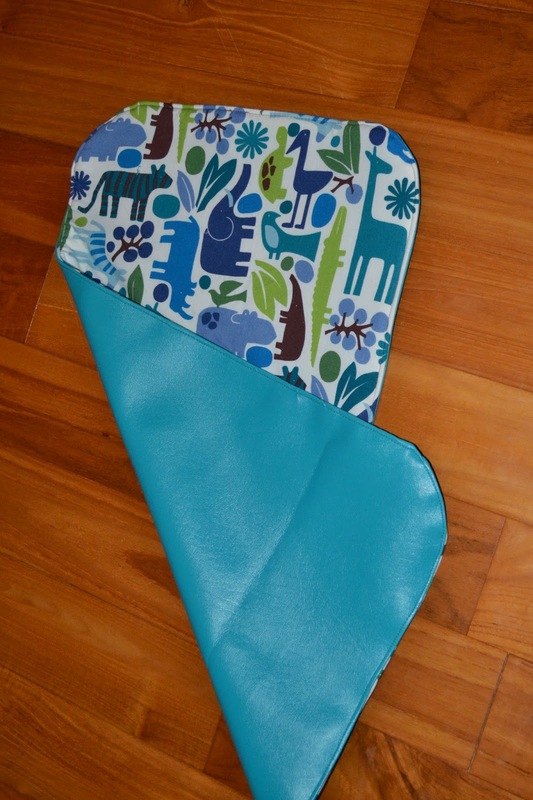 If you're shopping in remnants, just make sure that the diaper pouch pieces are AT LEAST 13" wide and the changing pad pieces are AT LEAST 15" wide. You'll also need a piece of velcro 3/4" wide x 1.5", fusible fleece, regular fleece for padding, a sewing machine, scissors, pins, thread, etc. Start by cutting your pieces. 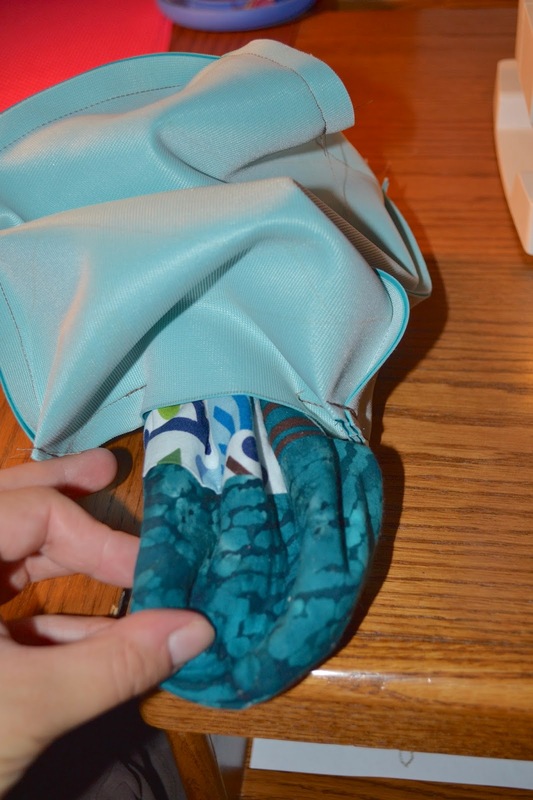 The majority of this tutorial shows the blue pouch being made as that one has a pieced exterior. The pink will be exactly the same but the exterior is one solid fabric. 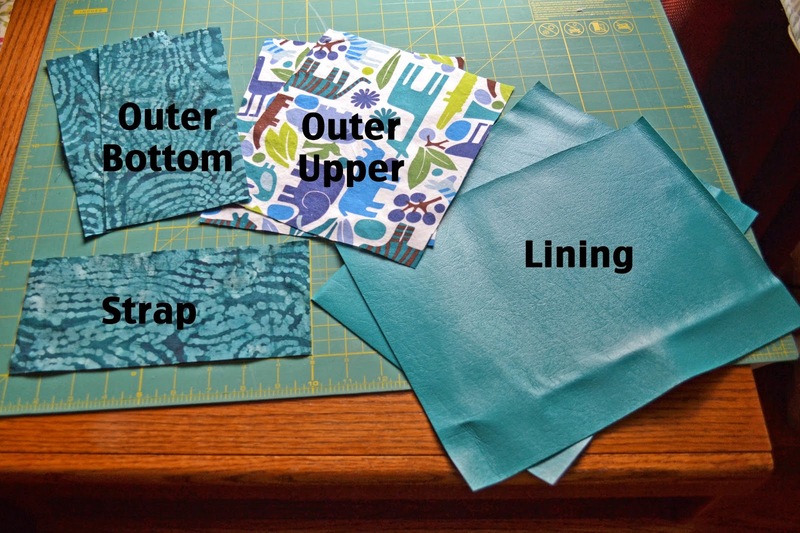 2 lining pieces 9" x 12"
2 strap pieces 2" x 9"
2 lining 9" x 12"
2 outer upper pieces 9" x 7.75"
2 outer bottom pieces 9" x 4.75"
To make the blue pouch sew the upper and bottom outer pieces right sides together using a 1/2" seam. This step isn't necessary with the pink pouch as the outer was cut as 1 piece. Once sewn, iron seams open. This will be the exterior of your pouch. 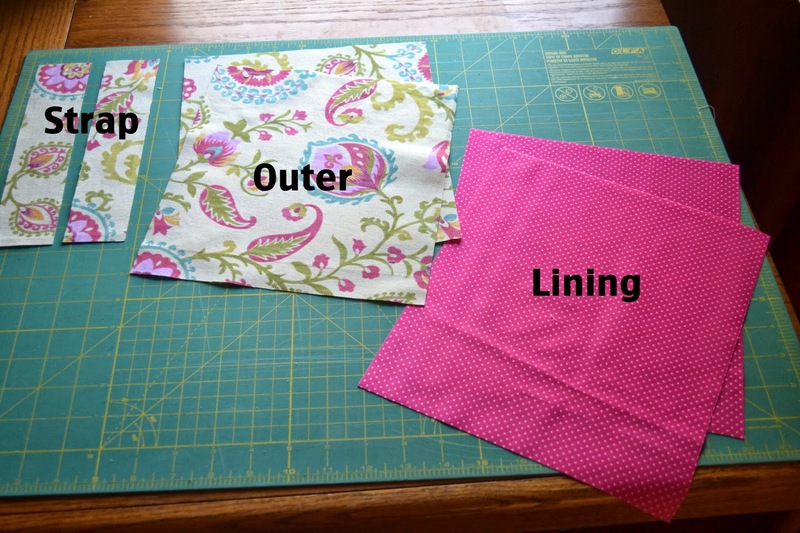 Cut fusible fleece to 9" x 11.5" and iron to back side (wrong side) of each exterior piece. 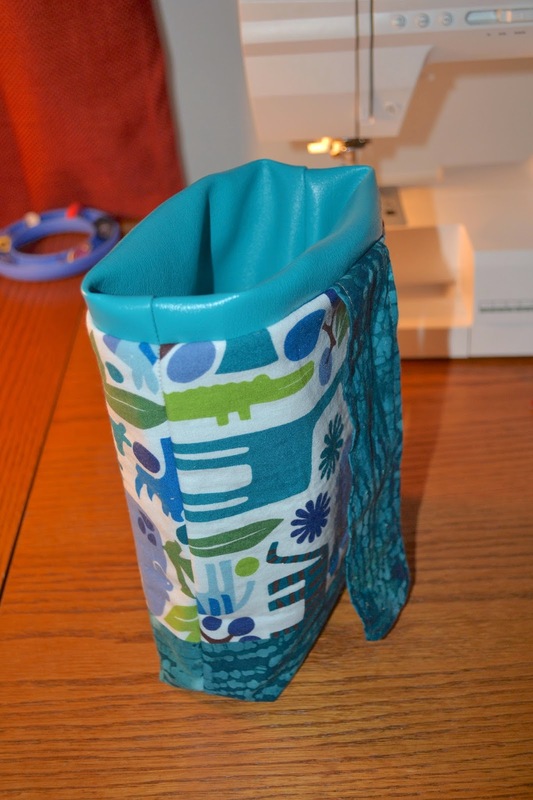 Make sure to follow the instructions of your fusible fleece. Mark 1.5" up and in from bottom 2 corners of exterior pieces. The arrows are pointing to the marks. With exterior pieces right sides together, and using a 1/2" seam, sew down one long side of exteriors backstitching over your mark. Continue down to corner, turn corner, back stitch over 2nd mark, sew along bottom edge, backstitch over 3rd mark, turn corner, backstitch over last mark and continue up the 2nd long side. Leave the 2nd short side open. Are you still with me?? See the close-up to the left to see where I backstitched. These corners will be cut later and it's helpful to have a little reinforcement. Now pinch the bottom corners of the bag together. 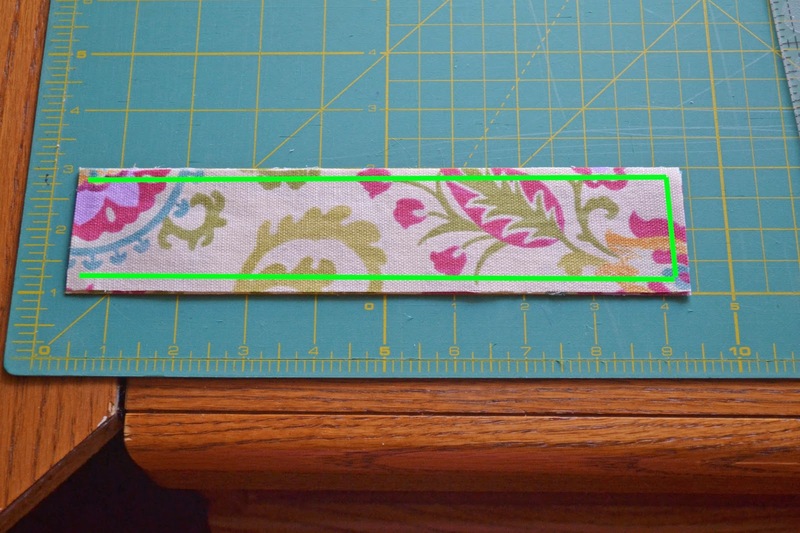 Sew a straight line across your marks approximately 1" from the sewn corner. I like to backstitch over it a few times and then snip off the corner. This creates the flat bottom for your pouch. Repeat for the other bottom corner and turn your pouch right side out. It's looking promising! (Sorry this is the pink strap!) It's now time to sew the strap. Take your 2 strap pieces and put them right sides together. Sew around the three sides marked in lime green, leaving one end completely open. Turn your strap right side out, press, and top stitch near the edge. Using a 1/4" seam, attach the strap to the outside of your pouch on the OPPOSITE side of the velcro. You don't want the strap and velcro on the same side of the pouch. Time to make the lining. Following the same steps you did above, put the lining pieces right sides together, mark 1.5" from the bottom corners stitch around the sides and backstitch over those marks. But this time, leave a hole in the bottom of the lining! So one short side should be completely open, and the bottom (other short side) of the lining should have a 4" gap in the center. See picture at left. Box and snip your corners just as you did with the outer piece- leaving the hole open. With the RIGHT sides facing each other, slip the exterior into the lining, matching up the top and side seams, pin and sew all the way around the top still using a 1/2" seam. This will all make sense in 2 minutes. I'm not crazy though. Remember that crazy hole in the bottom, this is where it comes in handy. Reach in and pull out the exterior pouch. You are going to turn the whole thing right side out through this hole. Go slowly and it will work. Keep pulling until the whole bag makes it through the hole. Now is when you sew the hole closed. Since this is the lining and no one will see it, you can just sew it closed using a small seam allowance. If you want to blind stitch it closed, you can do that too. Now push the lining into the the exterior. Holy cow we're so close! If you remember, we made the lining a bit taller than the exterior. That leaves this awesome little lip around the top of the bag. Stitching in the space between the fabrics, stitch all the way around the top of the bag again. This will keep the lining in place. Sew the other half of your velcro to the strap and you're done! Now onto the Changing Pad. This thing is silly easy. It is 2 long seams. Seriously. For each pad you will need some kind of waterproof, washable layer. You can use vinyl, PUL, or even quilter's cotton with a layer of clear vinyl over it. You will also need a layer of fleece for padding. I prefer fleece to batting for this because then I don't have to quilt the finished pad and it washes well. And finally, you will need some neat patterned fun fabric for the back. Cut a piece of each of the 3 fabrics to a 14" x 24" rectangle- you can make this bigger but I wouldn't recommend it much smaller. Most commercial changing pads are in the 12" x 21" range and they're just too small in my opinion. Take the first layer of your pad and lay it out. Find a bowl and trace the curve at each corner. Then cut this curve off. You don't have to round the corners but I prefer it. Once you do all 4 corners, it should look like this. Repeat until all 3 layers have rounded corners. Layer the 3 layers in the following order. 3) fleece on the top. The front and back fabrics should be facing each other. Pin or clip all the way around the layers to hold the sandwich together. 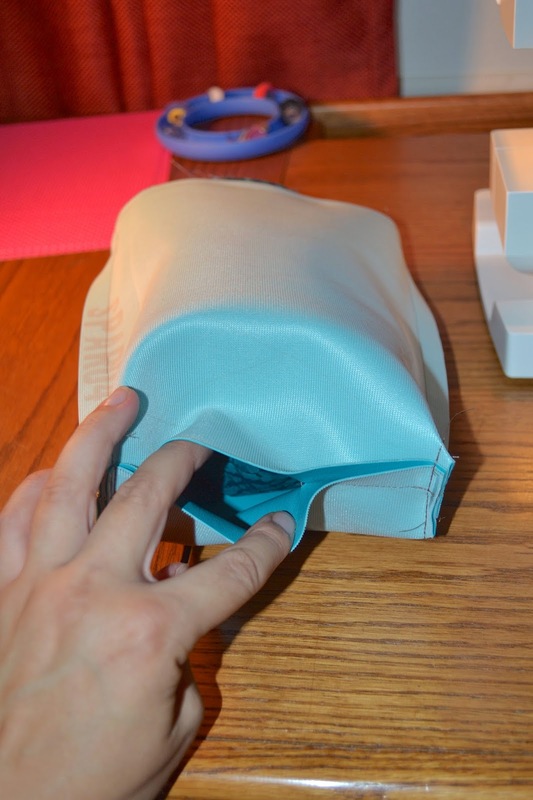 Using a 1/2" seam allowance you're going to sew around the pad leaving one short side mostly open. See my fingers? Don't sew between them. I mark my endpoint with a double clip or double pin so that I don't forget to stop there. Once you have it sewn, reach into the pad between the front and back fabrics, turn it right side out through these 2. This will leave the fleece stuffed in between them. Once it's right side out, push the corners out and top stitch around the exterior using a scant 1/4" seam. Make sure you fold the fabrics at the opening inside the pad once you get to them. This will close your hole. If you happen to make one of these, send me a picture to oursouthhouse@gmail.com and I'll include them in this post!